The dynamic breathing phantom (TBP) is based on the Alderson Radiation Therapy (ART) phantom. The soft tissue materials in the breathing phantom are elasticized versions of the same materials refined for the ART phantom. Rigid bones are incorporated and move under the respiring motion in the phantom. The elastic lungs have realistic respiratory density. The breathing phantom torso mannequin is a complex plastic simulation of a humanoid torso including lungs, ribcage/chest-wall bone, skin and sub-dermis, and an independently movable tumor within one of the lung volumes. Under the programmed application of increasing and decreasing air pressure, the phantom lungs fill and empty of air to replicate humanoid lung function. Chest movement of one cm and more can be programmed. As the lungs expand and contract, the simulated ribcage bones move as the anterior and antero-lateral skin surface. Under the independent programmed application of air pressure to one of several industry standard pneumatic motion actuators, target motion within one lung is accomplished. The materials and composition of the phantom are devised to be a faithful simulation of the physical form of a human thorax and to the radiological image properties. Respiration phase-gated computed tomography of the breathing phantom shows that it models the human thorax. 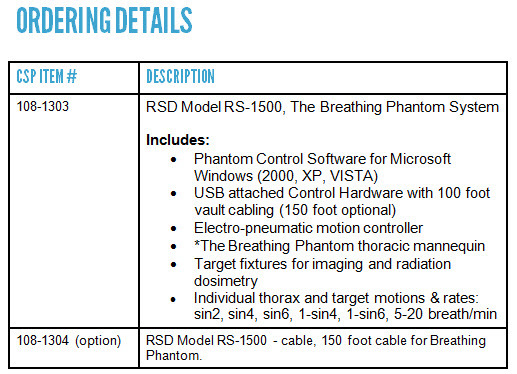 The Breathing Phantom is delivered with control software developed at RSD using industry standard LabView™ software. This ensures compatibility with evolving Microsoft Windows™ computer system software. The software communicates via Universal Serial Bus (USB) with an industry standard data acquisition and control module. Durable and transferred user run-time licenses for these software and control components are provided with the breathing phantom. Independent motions are provided for lung and target waveform, phase, and rate.